The November 8th Fox Hunt was blessed with wonderful sunny fall weather. 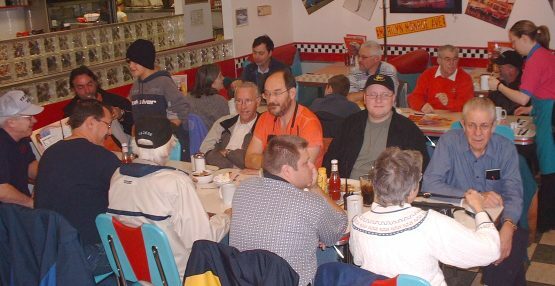 While brisk, about 30 people joined organizer Terry VE3NSV at Angel's Diner for breakfast and to hear the rules for the mornings event. As you can see from the photo, club members and visitors took up the whole back corner of the diner. 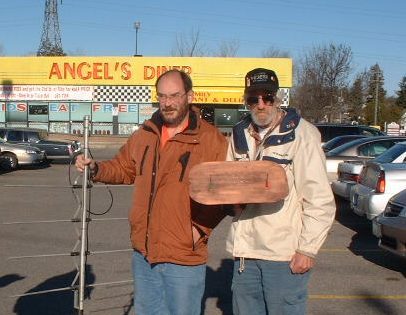 Having a good feed under our belt we moved to the parking lot where (l-r) Erich VA3XTO, Terry VE3NSV, David VE3DPR check out James VE3TNG's DF antenna that he built from the article featured in the foxhunt article on the web site. 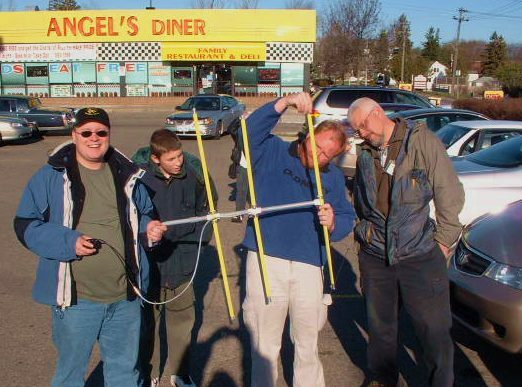 Made of PVC pipe for support and and pieces of a 3/4 inch measuring tape for elements, James's' antenna proved to be very accurate when used in conjunction with the attenuator he also built from the same web site article . Not to be outdone, the dynamic duo of Gord VE3EOS (l) and Don, VE3ESE (r) showed off their secret weapons. 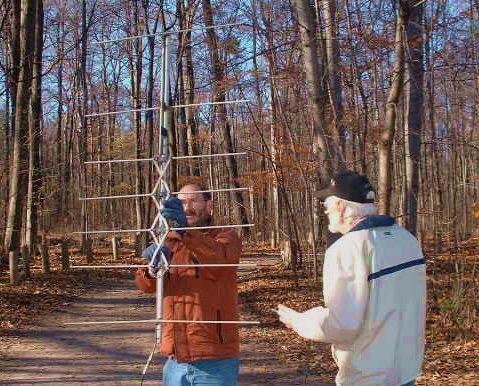 Gord is holding a modified FM broadcast antenna while Don holds a 2 element phased array with some form of noise bridge that provided an audio interference to the received signal from the fox giving the some indication of direction. In the end though just good old foot work with a keen eye worked well for the pair. So Don and Gord were the first team to show up at the general location in Steckle Woods off Bleams Road. After a few sample signal strength levels were taken, the gang felt it was safe to say that the Fox was not up in the trees. Don and Gord had the Forest to themselves for about 30 minutes before the next two teams arrived. The Ritzmann team of Erich and son David drove into the parking lot followed almost immediate by James VA3TNG accompanied by Marv VE2PK. However as you will read below James was the first to locate the fox. Meanwhile, back in the bush, Don and Gord were closing in on the unsuspecting fox. 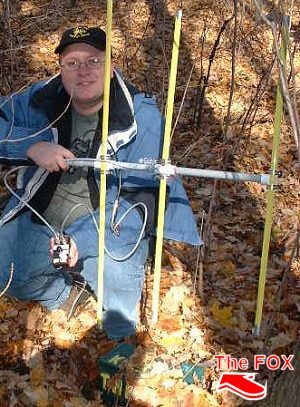 Don had now removed all antennas and was working only with his HT and attenuator walking a back and forth pattern which did work out as he found the fox partially hidden with leaves chained to the base of a large Oak. Meanwhile James was now heading towards the fox which was quickly recovered with leaves. It turned out that the home brew yagi James had built was very accurate and after some experimenting figured out how to triangulate his headings and quickly located the fox. Over the next hour the rest of the hunters arrived, some had city maps and used the driveway while others walked for close to half a kilometre through the bush from neighbouring roads. Ken Dobson VA3DDB from the Brantford club was next followed by Reg Bagshaw VE3BQQ, Dave Lamb VA3EZT, Al McLaughlin VA3TCO and his son from Hamilton and then Dave VE3RBA from KWARC. 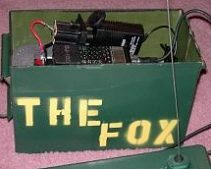 The elusive Fox was built by Terry VE3NSV in a war surplus waterproof ammo tin. Power by a sealed lead acid battery that was still producing 12.7 volts at the end of 3.5 hours of on air time. The radio was a dual band Alinco running about 500 mw just strong enough to be heard on an HT from the parking lot at Angel's. The ID and timer controller was a used CAT repeater controller provided by Tedd VE3TJD. It produced a CW ID and advertised the Fox Hunt at about 5 wpm followed by about 8 seconds of silence before it started over. Following the end of the hunt, Terry made sure it was close to a Tim Horton store where we all retired for some hot coffee, lunch, and time for Terry to make the awards. Grand Prize for his efforts at home brewing his antenna and attenuator went to James VA3TNG who won a VOM donated by Tedd VE3TJD of Laser Electronics in Baden.. Thanks must go out to Terry VE3NSV for his perseverance in keeping his event on track despite the bureaucracy that surfaced surrounding club insurance. Club President Ben VE3ST - who was on hand for the hunt - said; "we all hope this can be resolved before the next event".